Update, 23rd July 2018, on the Rooswijk excavation. When the cargo and artefacts on the Rooswijk was lifted in 2005, there was an eminent archaeologist, Alex Hildred, on board. She recorded everything and wrote her report on the cargo and other items found. As the vessel and cargo was from a VOC ship it belongs to the Dutch authorities by law. When the cost of recovery was taken, the silver and artefacts were presented to Holland as rightful owners. They have been distributed to the museums throughout the Netherlands and I have seen one display at Vissengen. The preservation of non ferrous metal is not as difficult as organic. Organic is also expensive to preserve and many archaeologists prefer to leave these items on the seabed until there is a time when they can, and have the right chemicals to do the job. However, on the Goodwins, the tide takes over and the lighter material gets swept away. After the recovery of the cargo and artefacts from the Rooswijk, the British Government designated the ship as a protected wreck site with a licensee to oversee her. Diving on protected wreck sites only allow a look but don’t touch procedure. It is very difficult to get an excavation license from Historic England. Possibly, as the Rooswijk is still owned by the Dutch, that is why an excavation is being carried out this year. With the Stirling Castle, the licensee spent a lot of his own money in the surveys and recording her condition each year. When he could see rare artefacts being destroyed and washed away by the tides, which he was not allowed to recover, he applied for dispensation. It was refused. He could also see that the whole wreck was being destroyed by the tide and weather and came up with a plan of preservation. Again the government refused to finance the scheme and her fate was sealed. Therefore, it is down to money why a lot of our underwater heritage is lost. I have always found it strange that the Mary Rose has had millions spent on her recovery and preservation; yet the Stirling Castle, when she was first discovered was almost complete and in far better condition. Unfortunately the Stirling Castle did not have Royal Patronage! Interesting to note that the word 'treasure' from ship wrecks seems to encompass anything metal, coins, portholes, cannons, bullion etc. Its a shame that the historical worth of the organic materials such as everything else that makes a ship work such as wooden, fabric, leather etc. objects are of more interest, and can provide more historical information that the latter. Sadly the rifling of a ship wreck for the 'treasure', regardless whether it was a couple of hundred years ago or today is generally detrimental, and often destructive, to the organic items. As mentioned, the organic objects recovered from the Mary Rose, including the remains of the ship itself, told use more about the Tudor sailors and their living conditions than the cannons, or any treasure? A similar scenario can be seen with the organic artefacts recovered from HMS Invincible c.1758 (also beneath the waters of the Solent), where the everyday stock of the ship provided more information about life-on-deck than any other English (previously French) 18th century warship, HMS Victory included. Many of the objects from HMS Invincible can be seen on display at Chatham Dockyard, though sadly it would appear that nearly every museum close to a coastline possesses an assortment of items recovered. Surely any comprehensive 'survey/excavation' of the Rooswijk remains would have produced an exceptional amount of the everyday organic objects, similar to those from HMS Invincible? If so, where are they and why are these not publicised, not just the 'treasure'? The question must surely be asked why was/is the Stirling Castle, being an earlier and better preserved wreck, allowed to fall apart despite its numerous monitoring surveys and books written about it and the Rooswijk make headline news? Could it be the vast amount of silver bars and coinage? The sad reflection of this is only the ships with a secondary commercial value, namely recoverable/saleable cargo, are only ever explored. Unfortunately, the changing of the below sea bed environment during this often aggressive and highly invasive procedure causes the rapid decay of organic items, all of which have survived for many centuries and would be of more interest to the historian. The Royal George, which was lost at Portsmouth did have quite a bit of 'treasure' on board. The Deane brothers did a bit of salvage in 1834, where they lifted 21 brass cannon from the wreck. They also discovered the Mary Rose whilst doing so; and picked-up a few pieces from her. Quex Park has some of the spoils. The Stirling Castle was discovered in 1979, and has been surveyed extensively ever since, with three books published about her. Most of the finds from her are in Ramsgate Maritime Museum. Although the 2.5 ton cannon which was recovered in 2000, has since been moved. With the sand receding from the wreck, she had degraded to a point of being almost unrecognisable. The Rooswijk was pounded on the Sands when she was wrecked in 1740 and over the years was also demolished. However, a month of recovery from professional divers found most of the valuable cargo in 2005. Some of these finds are still available on eBay. Not sure what the coming survey will find if there is not much to see though? Nothing to do with the large amount of silver bars and coins already recovered. All in the public interest of saving it for future generations? So why has the Stirling Castle or the Royal George not been excavated/cared for. Could it be the lack of 'treasure', or am I a cynic? From July to October this year, an international team based in Ramsgate will map the wreck and secure archaeological material for future generations. The wreck is threatened by natural conditions such as currents and shifting sands and an exploratory study of the wreck last year has made the need for excavation even more urgent. It's amazing what you learn on here! Fascinating. Thanks for the post. Over the centuries there have been reports of treasure being discovered on the Goodwin Sands. However, it was not until 2005 that these rumours became fact. when the contents of the Dutch East Indiaman Rooswijk’s cargo of a thousand bars of silver and 36,000 pieces of eight were recovered. The Rooswijk had set sail with a full cargo from the port of Texel on the 8th of January, 1740. Her destination was the Dutch East India Company’s (VOC) headquarters in Batavia (now Jakarta). A few days later and at night in a snow storm, which was being whipped up by a severe north-east gale, she ran aground on the Goodwin Sands. The surf was so great, the vessel was instantly swamped and the crew’s actions were rendered powerless. The ship was quickly pounded to pieces and all the crew, plus 250 of the companies solders, perished. 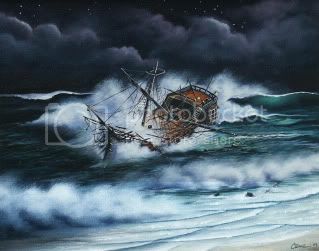 Such was the ferocity of the storm there was nobody about to witness the mariners plight. The following day, wreckage was found washed-up on the beach. A Deal longshoreman found a chest that contained letters written in a foreign language; being an honest fellow he retuned it to the customs officials. It was from these letters that the tragedy was realised and the name of the shipwreck known, however, at that time, her remains were never found. The shape of the Goodwin Sands is changing constantly, as one year there might be an area where the sand has scoured away … then only to be filled the following year. Therefore, if a shipwreck is exposed on the Goodwins, there could be a good chance that it will disappear just as quickly as it was found. In 2002, a diver discovered the remains of the richly laden Dutch East Indiaman Rooswijk close to the Kellet Gut on the Goodwins. He then arranged that the dive support vessel Terschelling assist in his quest to recover her cargo. Although this was done in strict secrecy the Dutch Government, as owners of the wreck and cargo, was also involved in the venture. In the summer of 2005, the Terschelling anchored over the wreck and recovered the boxes of silver bullion. Onboard were archaeologists to record and recover artefacts for the Dutch museums. The immense value of these finds, academically as well as financial, have not yet been totalled. Nevertheless, they would have lain unnoticed, possibly forever, on the Goodwin Sands if it had not been for the dedication of the lone diver that discovered the wreck. The Rooswijk was made a protected wreck site on 18th January, 2007 by the government and English Heritage to enable no unauthorised diving to take place. It is now one of the five historic and protected shipwrecks on the Goodwins.